The number of jobs in the biggest companies is dramatically falling because they see employees as a cost and can raise productivity by hiring fewer people and doing more via automation. Yang, Andrew. 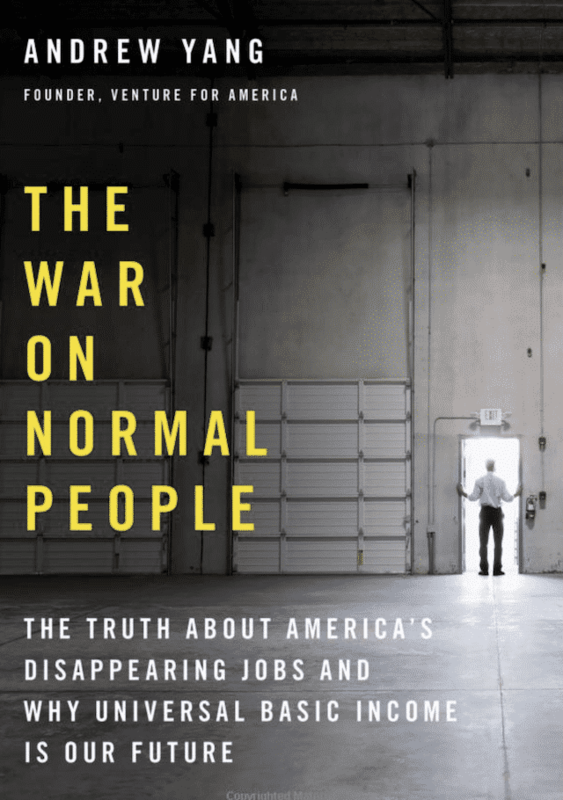 The War on Normal People: The Truth About America’s Disappearing Jobs and Why Universal Basic Income Is Our Future (p. 43). Hachette Books. Kindle Edition. The main job groups are clerical and admin staff, then sales and retail, food prep and service, factory workers, and transportation. Then there are professionals, creative workers, tech workers, and a number of other designations. But most jobs that will be replaced will come from those first several. The average age of truck drivers is 49, 94% are male, and they are typically high school graduates. Driving a truck is the most popular job in 29 states—there are 3.5 million truck drivers nationwide. Automation and AI will hit white-collar jobs as well. 5500 floor traders used to be on the stock exchange floor, and now it’s less than 400. Kensho is a report writing service that replaces 40 hours of work by a highly educated human with minutes of automation. No, we’re not going to have new jobs to replace the old ones lost to automation and AI. The test is not “Will there be new jobs we haven’t predicted yet that appear?” Of course there will be. The real test is “Will there be millions of new jobs for middle-aged people with low skills and levels of education near the places they currently reside? The place you live matters a LOT, and most of the jobs are in the cities, while most of the displaced jobs will be outside of cities, which are the same places suffering already. The unemployment rate doesn’t show people underemployed or not looking for work. In reality, the rate is FAR higher. We’re going to see higher productivity when the next recession hits because that’s when companies are going to lay off a ton of people and replace them with automation. That’s harder to do when things are going well. He jokes about Stanford being called SIT now (like MIT) because nobody’s doing humanities anymore. Scarcity is a poison that makes you less intelligent. Marriage is now an upper-class thing. Startups are like parenting: everyone has an opinion but nobody has a clue. His whole list on this is great. People who are displaced have no meaning structure, which is why we’re seeing so many people on drugs and disability. Young males are basically living at home and playing video games. A massive percentage of people who get displaced get on disability, and then never get off. And they’re discouraged from doing anything for fear of losing that check. The solution is we have to pay people to live, which will give them room to become productive. Some people will abuse it, but most won’t. It’s not enough to live on by itself. This should replace existing programs, not just add to them (which he is against). He also talks about social currency, where you get paid in some type of credits for doing things that help people and society. UBI has been endorsed by many conservatives as a simplified way to enable individual bootstrapping. When you have this much decline and suffering and lack of meaning you’re going to see a major move towards racism, and populism, which we’re already seeing. This is what got us our current president. This was due to tech / productivity increases removing manufacturing jobs and creating this vacuum of meaning and trust. That opens the door to the scapegoating of outsider groups. If you read this book you will realize that the system that America is breaking down, and that it must be replaced. This is not a dip or a recession, it’s a fundamental unmaking of the structure of society because everything was based on people having jobs that provided meaning. We don’t have religion anymore. People don’t get the same value from being home-makers anymore. And the jobs that used to provide meaning are being obsolete due to automation. This combination will destroy the foundation that makes democracy possible (a solid, educated population), and will push us right into a top rich class of 10%, and a bottom 90% that basically provides services for the top 10%. This is not sustainable. It will lead to more and more extreme leaders (Trump2 anyone?) and ultimately the very rapid decline of America as we remember it. The solution is to pivot VERY QUICKLY towards UBI and finding other ways for humans to provide meaning for themselves, and value to others. This change is going to happen either way; the question is can we address it beforehand with less pain, or afterwards with maximum suffering. 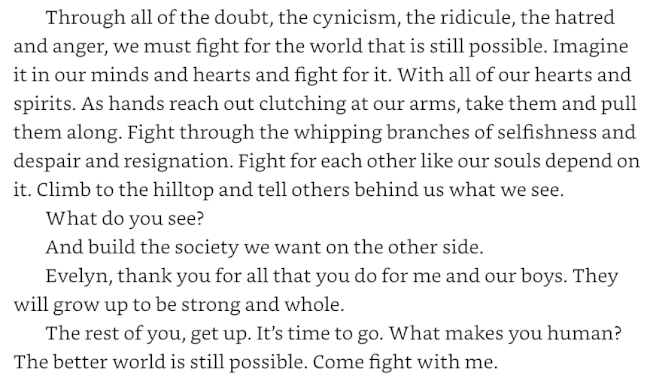 That’s a matter of foresight and courage. Try to get as many people as possible to read this book and to absorb its lessons. The more people who get the message the better the chance that we’ll be able to make the necessary changes. 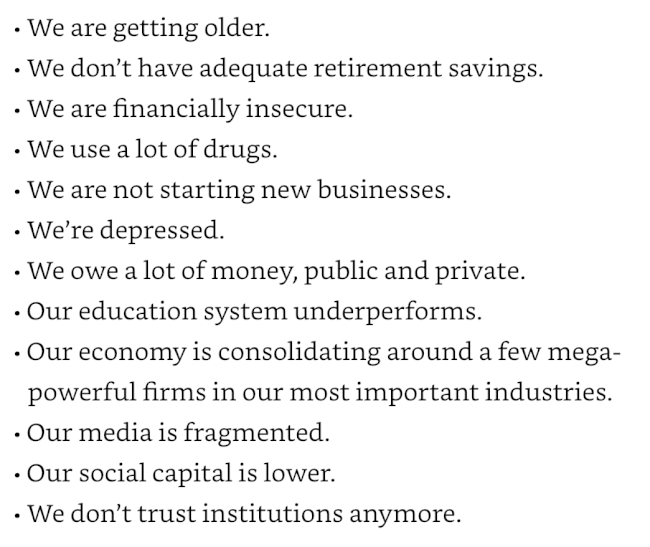 And in the short-term, make sure the people you care about are getting a degree and focusing on work that will be resistant to automation. Make sure you teach them how to find meaning outside of a standard job. They need to know how to create it for themselves. You can find my other book summaries here. This is why I am so passionate about the influencer scene, where people are building audiences and followings based on something they do well. It’s not about video games or whatever else they’re doing. It’s about someone doing what they enjoy and providing some kind of value to others. Peer-to-peer is the future of value exchange because the middleman doesn’t need you, and you have to learn how to to cut him out.